Join the fight against cancer with Yuvraj Singh. Here's an app for a noble cause. YouWeCan, currently available exclusively for the Windows Phone platform, aims to spread awareness about cancer. After his successful comeback to cricket following a battle with cancer, Yuvraj Singh has become a sort of mascot in the global fight against the most dreaded ailment of all. 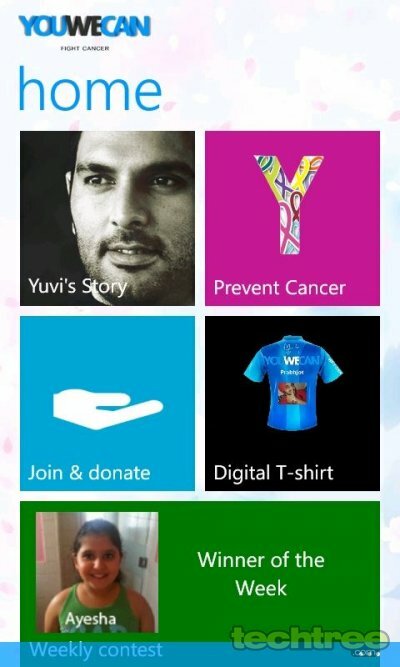 The app supports the YouWeCan Fight Cancer initiative by the Yuvraj Singh Foundation. The try-and-buy app is priced at Rs 565; a majority of the proceedings, it is claimed, will go to the Yuvraj Singh Foundation – which will utilise it towards the treatment of cancer patients. YouWeCan has a picture book of the cricketer with photographs since his childhood days. A Prevent Cancer section gives you information about the types of cancers, and about how they can be detected in the early stages. Users can also use the app to buy YouWeCan T-shirts, caps, and ribbons to donate. When you make a donation, you get a digital T-shirt, signed by Yuvraj, personalised with your name and photo. You can use it to start personal anti-cancer campaigns on Facebook and Twitter. If you purchase the app, you can enter weekly contests that feature Yuvi, cricket, and cancer. Also, you can win YouWeCan memorabilia, and your picture might get to the cover photo of the app as Contest Winner for one week. Check out the image gallery below for more screenshots.